It was a cold morning in Colorado Springs in the US. Robert Angierre, a magician, walked towards the workshop of a scientist regarded as a disgrace to the scientists’ community. Entering an area cordoned off by an electric fence, he noticed bulbs lit all around in the snow. The bulbs were drawing electricity without any wires. The scene is from a 2006 movie, The Prestige, and the events depicted by the film’s director are not fictional. They almost accurately describe one of the most eccentric geniuses of the last century, Nikola Tesla. In 2007, a group of scientists at MIT gained recognition because they wirelessly transmitted energy to a distance of 2.3 metres through air. This feat was first achieved more than a century ago. 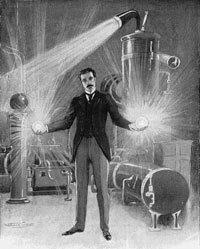 On July 4, 1899, Tesla was busy with his experiments to prove that Earth behaves as a conductor of electricity. The discovery of the electrical conductivity led him to another feat. Using Earth’s electromagnetic waves, Tesla transmitted signals over several kilometres and lit neon tubes connected to the ground. But to this day, nobody could figure out how he did it: two-thirds of the schematics existed only in Tesla’s brain. Tesla could fit into many stereotypes of eccentric scientists: he was celibate, hated round-shaped things and anything that was not divisible by three. The Croatia-born engineer spoke eight languages, developed technology that harnessed electricity for household use, and invented the electrical generator, FM radio, spark plug and the fluorescent light. He had a steel-trap photographic memory and could visualise even the most complex pieces of machinery. Starting off as an apprentice to Thomas Alva Edison, he soon parted ways when Edison was pioneering electricity distribution with the direct current model. Tesla opposed the idea and eventually partnered with George Westinghouse to develop alternate current systems. Tesla was also known for his showmanship. He presented his innovations to the public like an artform. The Tesla coil blasted electricity through the room while the terrified audience was constantly assured it was safe. In the early 1900s, Tesla ordered the construction of the Wardenclyffe Tesla Tower, about 100 km from New York. The giant structure was designed to wirelessly transmit power over cities across the Atlantic. The tower has often been blamed for the 1908 Tunguska Event. Some scientists believed a test firing from the tower caused a meteoroid or a comet to fall. The celestial body fell in the Tunguska wastelands in central Russia, obliterating forests over several hundred kilometres. But nothing has ever been proven. Towards the end of his life, Tesla got fascinated with the vision of light, both as a particle and a wave. This led to the idea of creating a “wall of light” by manipulating electromagnetic waves in a certain pattern. The mysterious wall of light would enable time, space, gravity and matter to be altered at will, and engendered an array of Tesla proposals. It was precisely this invention that The Prestige’s protagonist sought. Tesla died alone in a hotel room aged 86. Like his life, the events that followed his death were also surreal. The FBI confiscated his belongings, allegedly searching for a weapon he had named the ‘peace ray’. No prototype was found. Tesla once predicted: “The household’s daily newspaper will be printed wirelessly in the home during the night.” We do not know if he was anticipating the Internet. Nikola Tesla was ethnically Serbian and his father was a minister for the Serbian Orthodox Church. Tesla was incapable of dealing with the physical world. He existed in the space between his ears. And he tried to changed the world so it resembled the one in his mind. Great men try to change the world because they are incapable or unwilling to alter their behavior. Increasingly, many of us sit alone staring at screens, while eating microwave dinners. We communicate without looking at each other face to face. Tesla enabled the electricity for this. Sounds like Tesla built our world to cater to his own agoraphobia. He was a rational genius when it comes to energy. But he did not understand human nature and that humans are emotional and irrational. His greatest failure was assuming that everyone could share his values.